Style statement. Installing a new entry door system is an opportunity to select from a wide range of features that will have an impact on your home’s curb appeal, comfort and energy efficiency. Photo courtesy of Therma-Tru doors. Let’s be clear. Replacing an old entry door with a new ENERGY STAR® door will not have the same impact on comfort and energy savings as sealing leaky ductwork or upgrading attic insulation. But unlike many other energy-saving upgrades, a new entry door can really change the character and curb appeal of your house. That’s why this improvement often makes its way to the top of a homeowner’s “to-do” list. 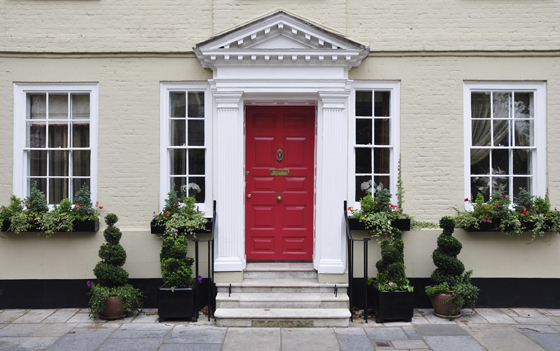 There are many factors to consider if you’re in the market for a new entry door. Just ahead, I’ll do my best to help you evaluate different features that will affect appearance, energy efficiency, maintenance requirements and overall value. Insulated glass, side lites & transoms. A “lited” entry door (one that contains glass) is often preferred because it brings in natural light and affords a view of the entry area. Door lites range from basic glass to all kinds of decorative glass treatments — from beveled edges to etched and “leaded” glass. All glass panels should be double-pane glass for energy efficiency. Some door manufacturers even offer triple-pane glass. Plenty of parts. When buying a new entry door, it’s important to consider the many parts and features that comprise the entry door system. Image reproduced with permission from the Minister of Natural Resources Canada, 2014. Many entry door systems include side lites and transoms to make an entryway larger and more dramatic. 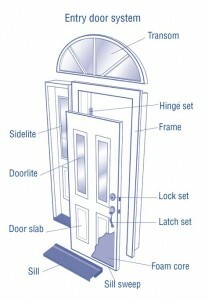 As shown in the drawing, a side lite is a narrow window of insulated glass located on the side of the door. 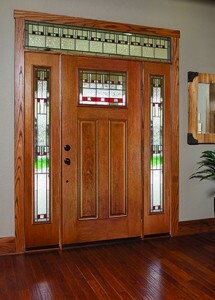 You can buy a pre-hung entry door with a single side lite or with a pair of matching side lites. Another option to consider is a transom lite –glass above the door. Skin & core construction. You can still buy solid wood entry doors, but I wouldn’t recommend this option, even on an historic house. Instead, choose an entry door with a “skin” of fiberglass, steel or PVC and a core of rigid foam insulation. Fiberglass doors with foam cores offer the best appearance, energy performance and long-term value. Leading manufacturers like Therma-Tru have become exceptionally good at reproducing the look and texture of real wood in fiberglass. Fiberglass entry doors are more expensive than steel or PVC doors, but most people appreciate getting the look of real wood, with better energy performance and none of the warping, weathering or maintenance headaches. Replaceable weatherstripping. An exterior door must have good weatherstripping to keep out cold winter drafts. Because door weatherstripping eventually wears out, the best kind to have is the replaceable, “C-fold” variety. This jacketed foam profile fits into a narrow kerf made in the door’s side and top jambs. Make sure your door also has door sweep weatherstripping to seal the space between the bottom of the door and the threshold. Aluminum threshold. Most exterior doors come with aluminum thresholds (aka sills), which withstand moisture and foot traffic far better that wood sills can. Hardware choices. When you buy a premium-quality exterior door, you’ll get to choose your latch and lockset hardware. Take your time. There are many styles, finishes and features to choose from, and the price range is huge. A basic prehung exterior door can be had for under $200 at a big box store, but high-end versions can go for several thousands of dollars. Where will you land on this price continuum? As you weigh your options, remember that this investment is one you’ll be looking at and using many times every day. I had seen this exact same thing when I was shopping around denver. I eventually purchased from Conservation Construction, but if i had the do-it-yourselfer brain I would have done it myself to save money on the labor.